We were a bit rushed into our first attempt at hatching chicks. One of the Brown Marsh Daisies went broody and we scrambled to get things together for her. As such we ended up with a less than ideal broody coop. The chicks quickly outgrew this and despite building an additional run for them it was soon evident that they needed to move to larger accomodation. 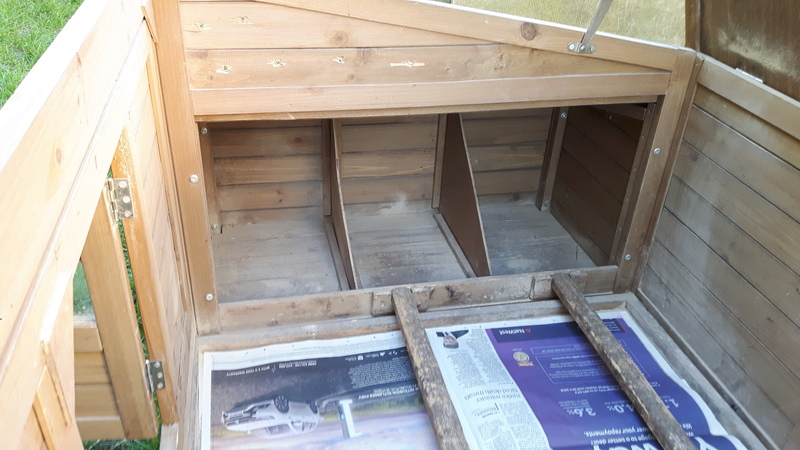 Between my poor woodworking skills, Sam working full time and us trying to keep Chi entertained whenever we do anything we realised that we wouldn’t have time to build the kind of coop we would want. It needed to be not too large (as we weren’t wanting to having many chicks at one time), easy to clean out and moveable. 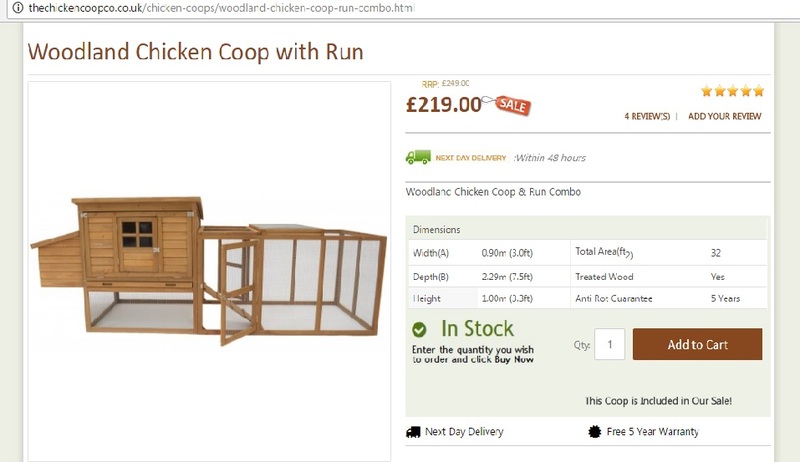 I searched the net and came across the Woodland Chicken Coop from the Chicken Coop Company. It seemed to tick all my boxes, I especially liked the slide out tray and the ability to open both the side and the top. It was on a special sale as well so we quickly bought it, there was less than 24 hours of the sale left. Unfortunately, as with most rush purchases, all was not as it seemed. We put it together easily enough (of course with help from Chi), and moved the chicks as soon as possible. I was really happy with it, until I went out the next morning to let them into thier new run. It was 8am and the house was in the shade of a large mirabelle plum tree but the window was steamed up. I quickly let them out and when I opened the roof door the heat hit me in a wave. 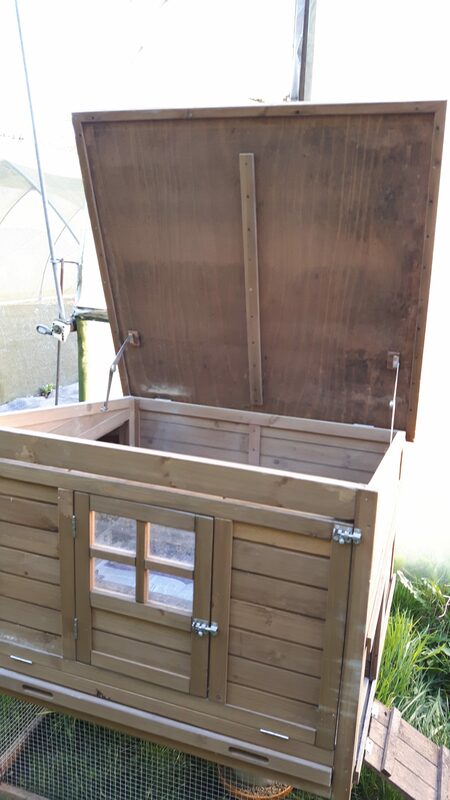 I then realised there was absolutely no ventilation on the coop at all. Sam quickly got to work with the drill to get some holes in the highest point. I went and looked at the website again to see if I had missed some instructions about ventilation but there was nothing. I was surprised to see that the coop was on sale again, at the same price we had paid, but that sale was also ending soon. Ah the eternal sale. Within the first week we noticed the second problem with the coop. The nesting boxes are level with the perches. Chickens like to perch at the highest point and so you want your perches higher than the nest box to keep things clean. The chicks were sleeping in the nest box or perching on the edge and then pooping in the nest box. 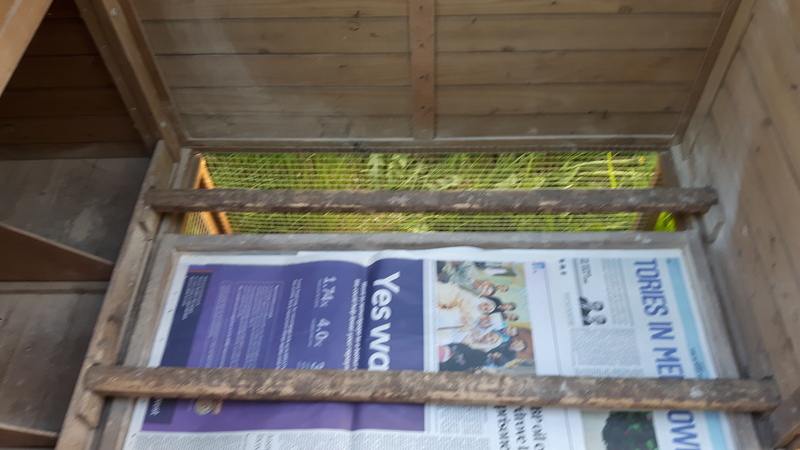 I cut out some of the cardboard packaging that came with the coop and created a false wall so they could no longer access the nest boxes. Afterall no-one in there should be laying. Bodge job #2. 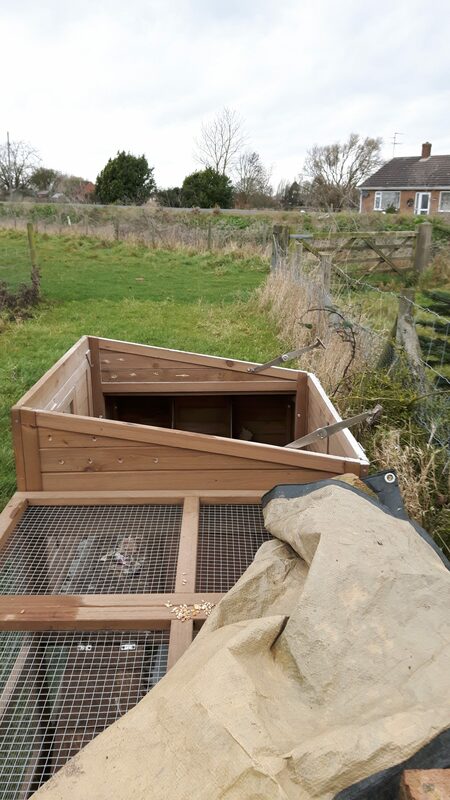 The coop was moveable, which was an important factor for us as with such a small run we were moving them to a fresh patch of grass regularly. A nice feature would have been a way to keep the ramp lifted up as trying to stop it from hitting you in the face when you are lifting the coop wasn’t the easiest thing. The coop then seemed to be ok, until one day in the autumn I opened the roof door to find black mould along the underside. The ventilation job Sam did must not have been good enough. Unfortunately he had drilled holes on all the available ‘good’ space. They say for ventilation it shouldn’t be level with the birds heads so that they don’t have a draught, but the way the roof slopes that is only possible on the top most corner. Then the final problem hit on a slightly windy day. We were under the bird flu prevention zone and I had covered the run with tarp held down with some bricks. I went out to check the tarp was in place once the wind died down a bit. I was very surprised to see the tarp in place but 3 cockerels running around the field and the roof door, that I had been so in love with, over the fence and in the other field. It had ripped clean off it’s hinges. 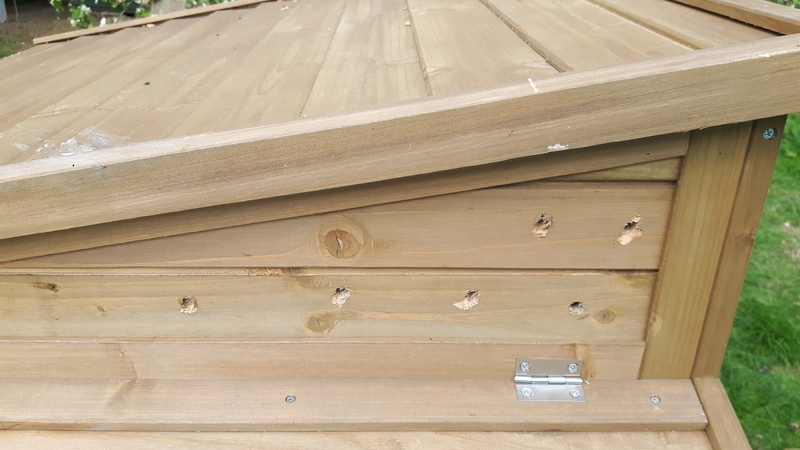 Although there were good locks on the run, the side door and the nest boxes, there was no catch at all on the roof door. The wind must have got under it and raised it (it has handy locking arms to keep it open for you), then taking all the force of the wind it would have been too much for the screws, especially with the damp damage from the lack of ventilation. The upside of the coop was that it was indeed very easy to clean out. I had read about small openings and hard to clean out coops but this one was a dream. I think the multiple entrances, sliding floor and removable percehes really help. 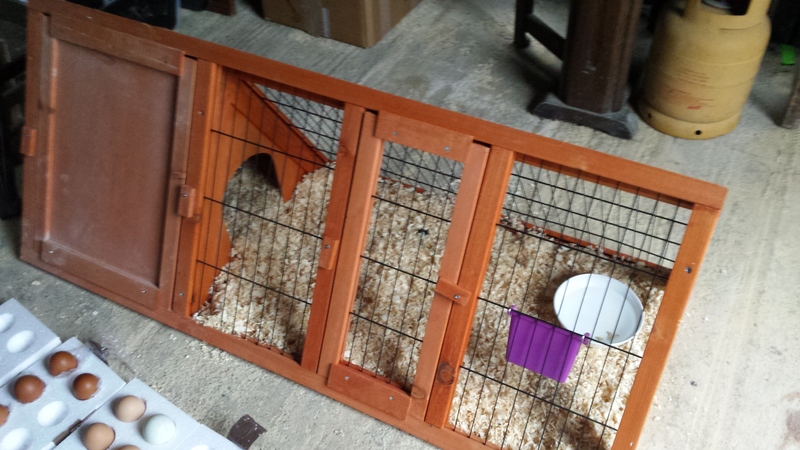 In short I think I have learnt my lesson and will stick to things we have built (should be easier now Chi is older) and sheds we have modified. Having the problems with this one has really made me appreciate our job on converting the shed into a hen house. We’ll fix up this coop, see what we can do about ventilation and use it as a quarentine coop for new or sick birds.